Never underestimate the value of the U.S. government when it comes to surreal and absurd images, many of which are in the public domain. I mean it. And, if you’re easily offended or the subject of VD bothers you, avert your eyes. Seriously, this poster (at right) appears to be in the public domain. (See notes at the U.S. National Library of Medicine.) You can download a 4MB copy of it at the gov’t website. I can see so many very wrong uses for that image. I’d like to put it on a tee shirt, except that I want to replace the VD words with… something else. I’m not sure what, yet. However, that’s not the only image of its kind. 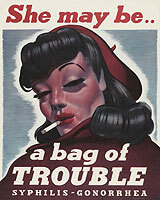 A search at the gov’t website using the phrase “venereal disease” turns up all kinds of strange posters of apparently dangerous women. I’m amused by the phrase “‘good time’ girls.” It makes me wonder, were there “bad time” girls? That poster is in the public domain. The next poster for your consideration (or amusement) is about clean water. Gosh, it looks like our boys were dealing with all kinds of dangers in the 1940s… wasn’t war enough? Because that was produced specifically for government use, I’m pretty sure it’s in the public domain. Click the image to see a really large copy of it. There may be even bigger versions in the NLM files. And, so it’s not all one-step-away-from-zombies, at left is an early poster that has a lot of possibilities if you’d like to alter it for a political statement. If you have questions about copyright law and what’s in the public domain, one of my favorite resources is Cornell’s chart about copyright terms and limits. If you’re really concerned about the details of copyright law and art, the following book is one of the most complete (and recent) to address this complex subject. Previous Previous post: Copyright and Free, Royalty-Free Resources… again!